This past weekend, my husband and I breathed a sigh of relief as we crossed the threshold of fetal viability: this is the point in gestation—23 weeks—at which a fetus can have a reasonable chance of surviving in a NICU should some series of complications lead to preterm labor. Of course, there is a reason a fetus gestates for forty weeks; if ours did make an arrival this week, we would likely be looking at a months-long NICU stay, an inconceivably large bill, untold stress, and the certainty of an uncertain future as far as the baby’s health is concerned. Even still, “viability” is a significant milestone in a pregnancy. Perhaps nobody knows this more intimately than the women who have carried children of their own, an experience I have found, as a first-time-pregnant-lady, bewildering at every step of the way. With each passing week, I am hyper-aware of the things I should and shouldn’t be doing, and yet, as a friend told me early on, it is really not up to me whether the fetus develops normally or not. Apart from the ordinary restrictions on behavior and consumption, fetal development is a biological marvel in which I am merely a host, not a participant. To feel at once so protective of this bundle of tissue and bone, and yet so incidental to its survival is bewildering indeed. I found out I was pregnant on December 22. We had been trying to conceive for sixteen months by then, and—knowing we had financial, emotional, and physical limits as to what medical assistance we would seek—we were beginning to wonder whether pregnancy was in our future at all. When you’ve been trying that long, you know with precision when your chances of conception are highest and what clues your body will offer that point to success or failure, so by the time I got a positive blood test (first on the 20th, then a verifying draw on the 22nd), I was already settling into the fear of what comes next. And this was a wanted and planned-for pregnancy. Every day I wondered: will it stick? Will it be okay? Are we really ready? In any other case—including criminal acts not reported within the specified time frame (as well as those perpetrated upon a minor), abnormalities that do not qualify as “incompatible with life” but which, nevertheless, would introduce hardships for which a parent is unprepared or ill-equipped, or simply the totally understandable desire not to carry an unwanted pregnancy to term, a medical decision that is nobody’s business but the woman’s own—an abortion will be prohibited by law. We have no reason to believe Governor Reynolds will not sign the bill as soon as she it reaches her desk. At thirty-five years old, I am considered of “advanced maternal age.” This, combined with the fact that this is my first pregnancy, has led to increased monitoring of my health and the health of my fetus these last twenty-three weeks. I am at increased risk for complications of all sorts. Most prominently, my doctor recommended that I be screened for genetic abnormalities. Women used to have to submit to an amniocentesis for this information, a medical procedure that introduces at least some increased risk of miscarriage, as it involves inserting a giant needle into the uterus. Now, women can get the same information at a more reliable rate of accuracy with any number of non-invasive prenatal tests (NIPT), which can predict the probability of chromosomal abnormality by studying the fetus’s cell-free DNA that circulates in the mother’s blood. So, while these tests only require a simple blood draw from the mother, they can’t be administered until at least nine weeks into a pregnancy—long enough for the the fetal blood to be detectable in the mother’s, but outside the window established by the heartbeat bill. I have been a supporter of abortion rights in the abstract for most of my life, which is to say: I have not had to confront the decision myself, but I have known plenty of women who have, and I support their rights to make their own decisions about their health and bodily autonomy. Nevertheless, I have never thought so much about abortion as I did in the ten or so days between when I gave up two more vials of blood and when the results of that analysis were returned. For me, it wasn’t a question of compatibility with life: if it turned out our fetus suffered from Edwards Syndrome or Patau Syndrome, two genetic disorders that present grim survival rates, more often resulting in stillbirths if other measures are not taken first—the decision to terminate a pregnancy seemed, hypothetically, easy to me. Maybe not easy in the emotional sense (I don’t mean to trivialize a heart-wrenching choice), but unambiguous in the terms. It was the range of other outcomes that kept me on edge, the possibility of news that our child would be deemed healthy enough to have a chance at life, but not so healthy that our own lives wouldn’t be upended by the demands of a child who needed more than we were prepared or equipped to handle—emotionally, financially, practically. Could we afford the kind of care such a child might require? Would one of us have to quit our jobs to become a full time caregiver? Would our marriage survive the stress? My husband was eager to tell our families our good news; he wanted to tell them the moment we first saw a heartbeat. I insisted we wait. I didn’t want to have to explain myself, ourselves, if something should change. I don’t know what decision we would have made, had we been forced to make one. I don’t know if it would be possible to be totally assured that we were making the right choice, regardless of what that choice would have been. I do know that we should be able to contemplate our options and commit to a decision without the interfering eye of the state obligating us to something we are unwilling to pursue. I only knew I was pregnant because I had been trying for so long that I knew the exact earliest date at which a blood test would reveal elevating levels of hCG (the hormone signaling implantation). I got a positive test at 4 weeks + 5 days because I was paying attention. Most women and girls wouldn’t know that early. A six week deadline is laughably restrictive. Pregnancy wreaks havoc on a woman’s body under the very best of circumstances. It is even more burdensome when accompanied by complications, or resulting from trauma, or before a body and mind are developed enough to accommodate it. I think about how anxious I was in those ten days this winter—how anxious I still feel about becoming a parent, even as my belly swells and my older brother promises hand-me-down snowsuits from his own boys (is there anything more adorable than an infant in a snowsuit?) —and then I think about all of those women and girls who find themselves confronting the unwelcome news that they are pregnant, and who suddenly have no option but to carry that fetus to term. The supporters of this bill say that they are “protecting the unborn.” How, exactly? Do they suppose that an unhappily pregnant woman or girl is going to magically transform into the portrait of domestic tranquility upon being forced to carry and deliver a child she neither wants nor is prepared to care for? This bill threatens to reduce the number of qualified OB/GYNs in the state, a prospect that would no doubt effect rural communities more egregiously than the cities: does the GOP have a plan for how to get these women the care they need while they endure an unwanted pregnancy? Our health insurance options are dire and worsening: does the state have a plan for how to help women pay for the high cost of pre- and post-natal care, labor & delivery, not to mention the care associated with complicating factors for mother and child? Our child welfare services are vastly underfunded: do they suppose an unwanted child will thrive among the other 5,000+ underserved children in foster care in this state? This bill is malicious and cruel, and plainly designed not to address any crisis in Iowa but to make a run at Roe v. Wade. Its supporters parade themselves as champions of virtue while neglecting all of the social services required to ensure the health of mother and child, and trampling women’s constitutional rights to bodily autonomy. It represents a vast overreach of government into the private lives of citizens, and will do nothing but endanger the lives and health of women and children across the state. Those who voted in its favor should be branded as anti-woman, anti-child, anti-life, and anti-health ghouls who seek only political capital at the expense of their own constituents’ well-being. NEXT POST Next post: Did Paul Ryan Buy David Young’s Vote On Healthcare? Yeah; they’re “protecting the unborn” all right! After the birth? Meh…not so much. 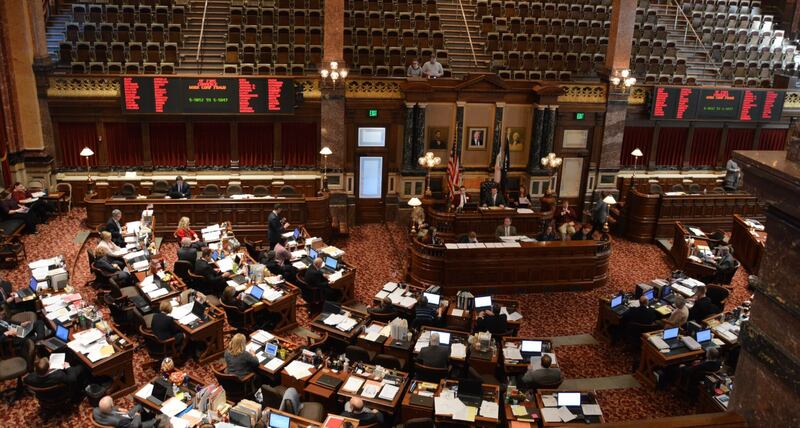 Iowa needs to add to its Constitution a recall option. Reynolds and her gaggle are acting as if they represent the people. They do not. Wow!! Of course those who supported the heartbeat bill will look the other way. Who needs facts or morality anymore, both trumped by power and ideology. Thank you, Allison, for sharing your story. The proven way to reduce abortions is provide women access to effective contraception. Instead the Republicans have closed women’s health clinics. Thank you for taking on the inhumane legislators who passed this bill. Congratulations on your pregnancy–I too was a pregnant 35-year-old (28 years ago). May all go well for you! Republicans are pro-birth NOT pro-life: they will do everything feasible to ensure that a fetus is brought to life but nothing to help it if it survives being delivered. Republicans will not feed the “baby” once it is born, nor clothe it, nor pay its medical or dental bills, nor pay to educate it, nor find a job for its caregiver/parents, but it will arrest it, and put it in jail if it does not behave according to the Republican ideal. A fetus is not a baby, regardless if there is a heart “beat”: the gestation period encompasses fetal cell development that continues through the eighth month. What Republicans ignore is it is the female carrying the fetus who has the right to determine if she will be a host to term or wants to abort the developing fetus. It is not for Führerin Kim Reynolds or any other women to make the choice, and definitely not for any man to control the pregnant woman’s reproductive abilities or outcome. The GOP legislature, the lowest form of a kakistocracy, is acting in an identical manner to the Reichstag under Hitler and should be voted out of office. I support the right of every female to have an abortion whenever and wherever the female wants one.